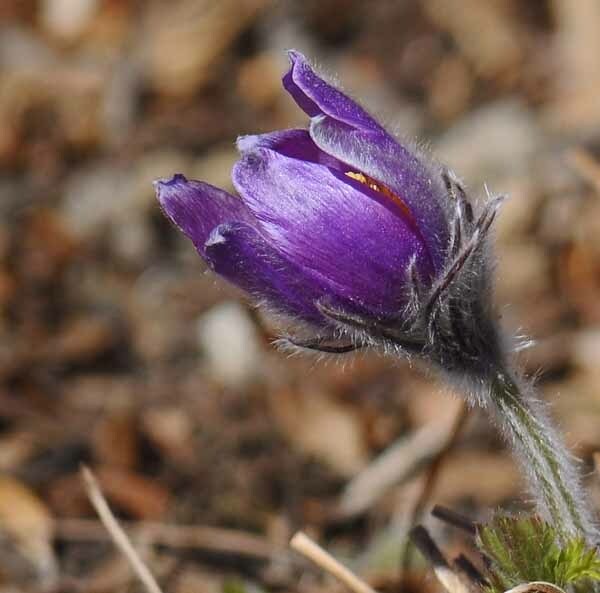 For March’s Picture This photo contest over at Gardening Gone Wild the theme is Awakening. I just got back in town yesterday and went to Conservation Garden Park to take pictures of the garden. On the to-do list for this fall is to plant more early blooming bulbs in my own garden. Here are some other photos. I had a nice time photographing for the little while I was there. I was quite surprised to see busy bees already about their business. I found two beds planted with crocus and sedums mulched with colored glass. I love purples and blues so I spent a lot of time around this bed below. This is where I saw the bees so they must love the blues too! I’m sure this bee would not be happy that I was posting a picture of its behind on the internet! This bed wasn’t as pleasing visually for me. I guess it was the green glass, but it does contrast nicely with the burnished sedum heads. I really liked the bulbs contrasted with the needled evergreens. In fact I like needled evergreens with everything. And back to the blue glass bed again. 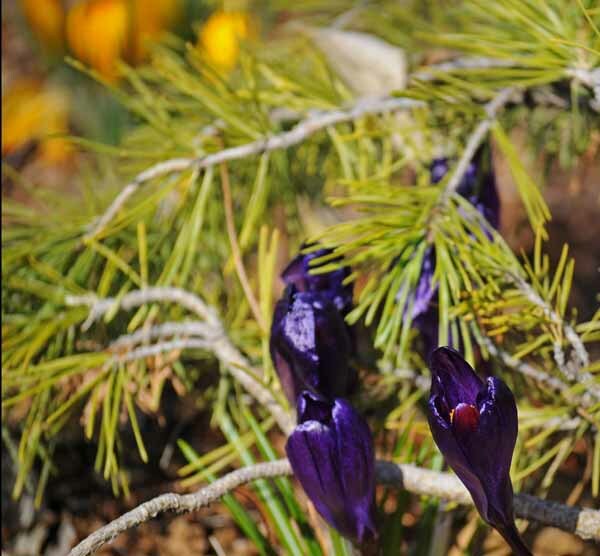 I liked the groupings of crocus throughout this picture. I think that may be tricolor sedum planted in there. It sure is pretty. I hope you enjoyed my spring awakening photos. Photography and gardening tips are always welcome. Thanks for visiting. I like the colored glass idea. 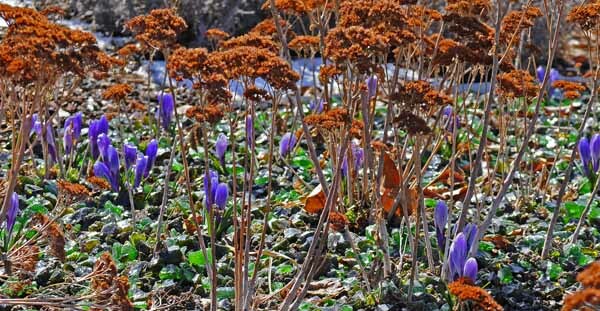 I was at the local botanic garden Friday where they had purple crocus coming up through Angelina Sedum. The contrast of that yellow/orange foliage and the purple blossoms was arresting. Best of luck in the photo contest. Ah Les, I did enjoy your photo of the “Angelina” sedum with the purple crocus. The combination is indeed arresting. I like the colored glass too. I like how they just did it in small beds. I’m not sure I would like to see an entire garden mulched in colored glass. The glass is so vibrant it would take the emphasis off of the plants. Absolutely wonderful shots every one! Good luck in the contest. Thank you Teresa and thanks for visiting my blog. Your blog is wonderful. I could get lost looking at all of your posts. LOL Gail. I had quite a few blurry bees. They were indeed hard to catch. I increased the shutter speed to try and stop them, but then they moved out of my then smaller depth of field. I’m trying to learn by doing. The camera is capable of so many things, it’s hard to remember what I’ve learned and then apply it. So I guess I just need to keep practicing. I’d love to share some Colorado Blue Columbine. I don’t grow your eastern native yet, so we could trade. I have seen it in our nurseries here so maybe I’ll jump the gun and get a plant. Ours needs the winter cold strat. to germinate too. So we could trade after they go to seed this summer or I could just send you some if I do jump the gun. Wow. What gorgeous pictures. I love all of the blue blooms too. 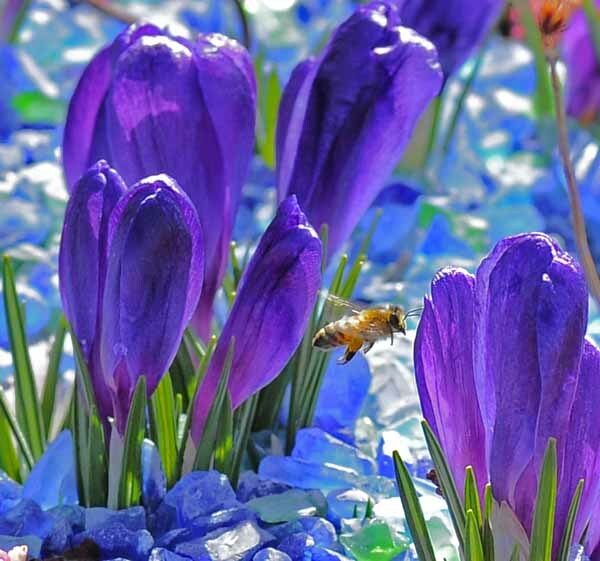 Is that blue glass you have around the purple crocuses? How gorgeous is that. Thanks for dropping by my blog. 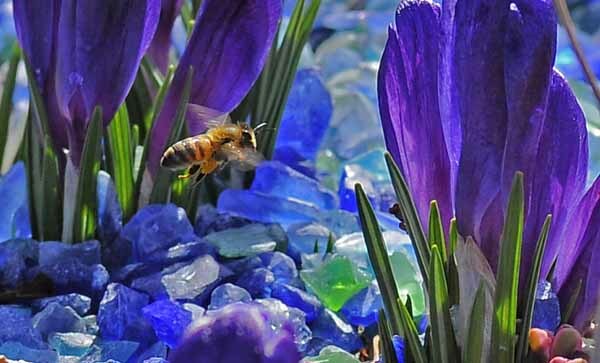 Sadly that’s not my design or garden -the blue glass with the purple crocus, but I do love the effect too. 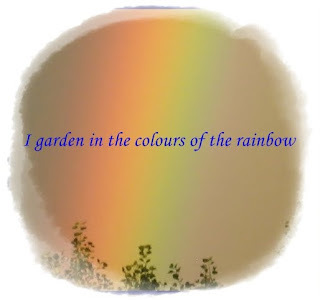 I enjoy both of your blogs the scenic and garden one! 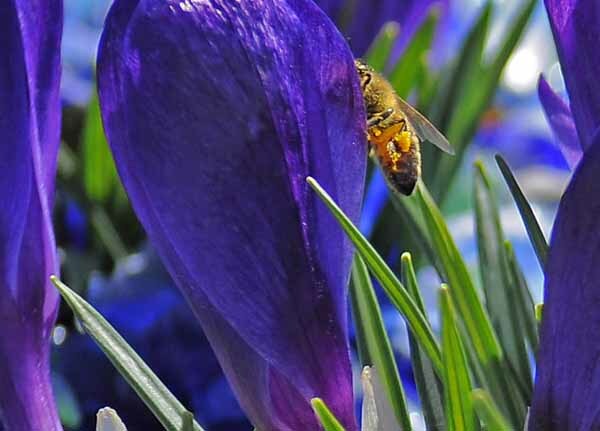 What an amazing picture of beautiful crocus and of course, the bee! I loved it! I was so happy to see the bees that day. I usually see bumbles first in my garden, so it was a pleasant surprise and definitely a wonderful sign of spring. 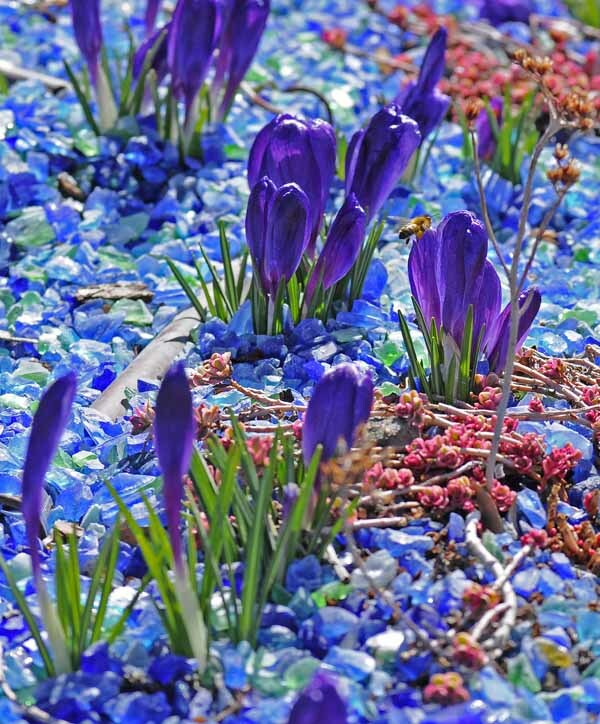 That blue glass is amazing – makes me wonder what I can use here instead of boring old brown mulch! I especially liked the photo that shows the little hairs on the plant – and the bee, of course! Great posy of photos! Isn’t that blue pretty? My sis has little pocket surprises of colored glass around her garden, and I really like the effect. I was thinking the mulch would be great in pots too. That could get spendy trying to cover a whole garden with it. Thanks so much for visiting. Great post. Those pictures are gorgeous. You’re getting mighty awesome with that camera. Keep it up! Fabulous post, I love the look of the coloured glass, I’ve never seen anything like it before but it’s really enhances the crocuses. 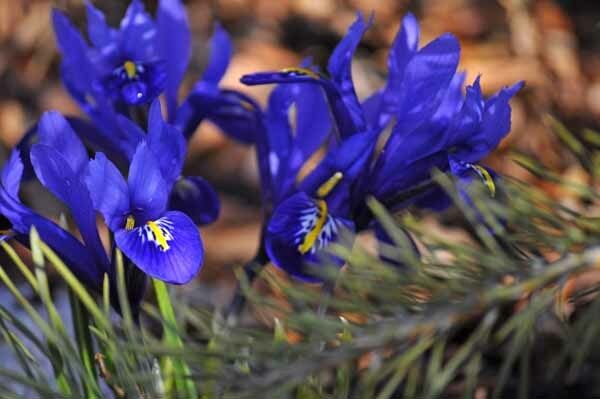 Your entry is stunning, there is nothing like a blue iris. I bought the songbook for “A Mighty Wind’, I just started playing the guitar and thought it would be a good way to learn lol. Daisy looks very content with her busy bee. That’s a great shot. My son and hubs both are taking guitar lessons. I’ll have to see if I can find that book- too cool. Congrats and good luck with the guitar playing. Don’t forget to crank it up to 11.
amazing pictures! I love the bee – those pictures almost look like cartoons with all those colors. Very cool. LOL! The colors do look rather cartoon like. The arbor looks wonderful. Great job! I just love that shot where you caught the bee in flight! So pretty. Hi, Robin! It was a bit of a lucky shot. 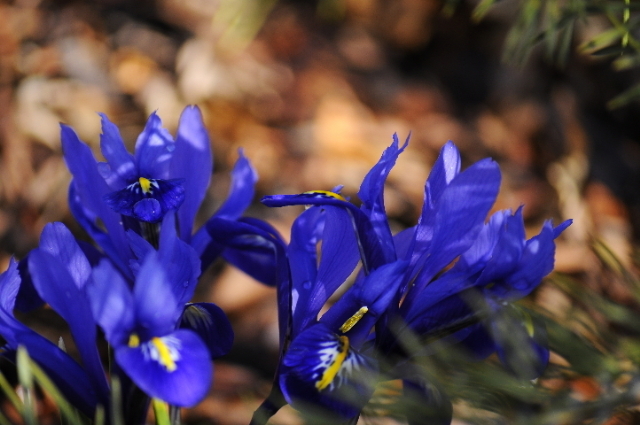 The bees really liked those crocus though so I had lots of chances.